Seeds in moderation are very good to offer your parrot. And some parrots need more seeds than others. But to keep a bird on an all-seed diet is ultimately going to sacrifice their health. Seeds contain fat.This fat is the fuel that provides the energy needed to turn into a plant. Sprouting the seed burns this fat and transforms the seed from one type of fuel into yet another. Once the seed sprouts, the fat is burned off and the life-giving nutrients begin to develop. It has transformed from a seed into plant and that’s where the nutrition begins to develop and the availability of those nutrients can be accessed through ingestion. Seeds are also deficient in calcium and vitamins as well as other important minerals and this is something parrots need more of than an all-seed diet can offer. And the seeds that are available have been genetically altered to produce high quantities, so not only is an all-seed diet not balanced, the quality of these seeds is very low. Many veterinarians can spot a bird on an all-seed diet just by looking at them. Their feathers are dull, dry and brittle. The health of your bird is primarily dependent on their diet. Food is a fuel that supplies their system with what it needs to function properly. And an all-seed diet just doesn’t cut it in the nutrition department. Many health problems are indeed the direct result of nutritional deficiencies. So what do you feed your bird other than just seed? Parrots are omnivores. They eat plants, fruits, vegetables, sprouts and the occasional insect. Offering vegetables is a good start to a healthy diet. Vegetables that are deep in color have been found to be more rich in nutrition than those that are not as vibrant. For instance, purple cabbage was found to be more nutrient dense than a light green one. The colorful red and orange vegetables are colorful due to two chemicals: carotenoids and polyphenols. These chemicals are antioxidants. Antioxidants fight the renegade free-radicals that can do damage to certain cells in your body harming the immune system. By consuming these antioxidant-rich vegetables, you are boosting the ability for the system to fight off disease. Root vegetables such as carrots, sweet potato, yams, turnips and golden beets are dense in nutrition. They develop in the heart of where they get their nutrition: the earth, so they are valuable to a bird’s diet. Lots of nutrition is found in the greens of these root vegetables as well. Carrot and beet tops are valuable as well as the green leafy tops to radishes. So don’t cut off the tops of those vegetables and throw them away. Offer them to your flock to munch on. Fruits provide good nutrition as well, particularly berries. Blackberries and blueberries are rich in many nutrients. And have you noticed more and more pomegranates and pomegranate juice available in the stores? There is a reason for that. Researchers have discovered that pomegranates are high in antioxidants, and they have a hand preventing heart disease and cancer. And if you look at their appearance, well, there’s that dark, rich color again. 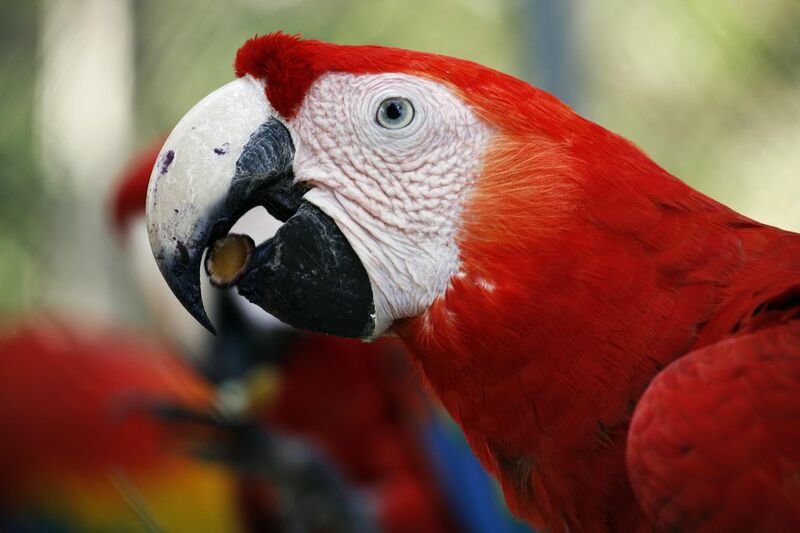 When considering what to include in your parrots diet, keep your eye on color as a factor in selecting fruits and vegetables to include in their diet. Try to get healthy grains such as quinoa and other ancient grains into your bird’s bowl. Taff, amaranth, farrow and buckwheat all add to the health of your bird as well as those colorful fruits and vegetables. As for seed? Moderation is something you should consider. Do your research on healthy seed and avoid feeding nothing but seeds high in fat. As for an all-seed diet? It simply won’t sustain your parrot’s health.